I was also curious to learn what Atmel Studio offered beyond the Arduino IDE – given that it is developed by Atmel. Of course the “Hello World” of microcontrollers is the Blink sketch, so that’s where I started. It wasn’t that tough! There are a number of programmers/debuggers that Atmel Studio natively supports. In addition to the official Atmel programmer and debuggers, there are a range sold by third parties. 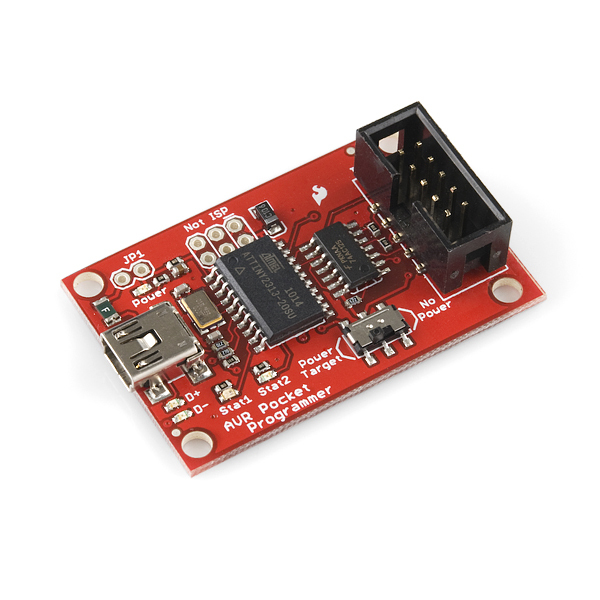 I won’t turn this post into a review of programmers, but will point you to a low-cost open-source programmer that I was using: the Pocket AVR programmer from Sparkfun (well, it’s actually based on the USBTinyISP, a collaborative effort). This doesn’t have built-in support in Atmel Studio, but more on that later. 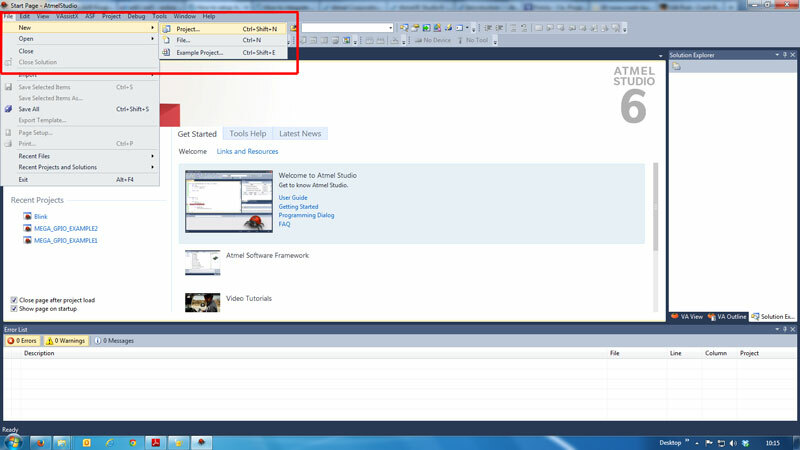 First up, you need to download Atmel Studio. I’m not going to hold your hand through this, it’s really straightforward. 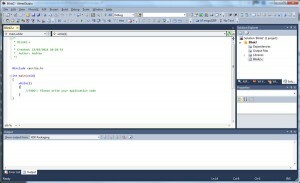 Atmel Studio is hosted in the Visual Studio environment – some people hate Microsoft, but I cut my teeth on Visual Basic nearly 20 years ago so I was comfortable in the environment. Sure it may be a bit bulky, but I found the interface easy to work with and I love the autocomplete. The project will now open with a skeleton code structure in place. 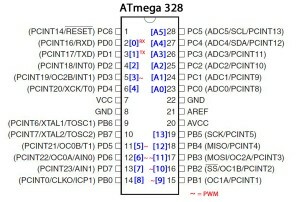 From this, you can see that pin 13 on the Arduino (in blue) is actually pin 19 on the ATmega328 chip. If you’re using the T-Board to build this project, then the pins are clearly numbered. 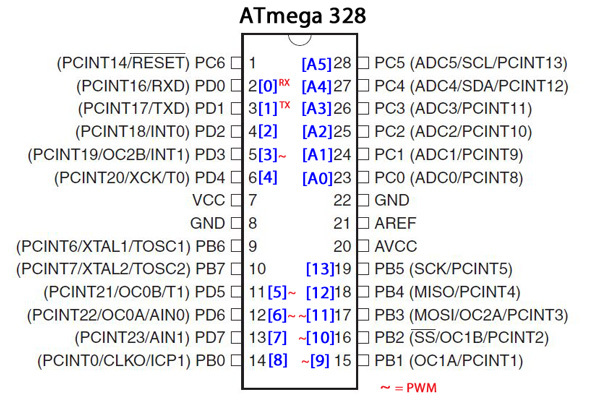 However, to confuse you even further, Atmel Studio doesn’t even use the chip’s pin numbers – it uses ports. The ATmega328 has 3 ports: PORTB, PORTC and PORTD. Each port has a number of pins (usually max of 8), labelled numerically. Eg. PORTB has 8 pins labelled PB0, PB1 … PB7. Looking at the diagram above, you can see that pin 19 is labelled PB5 – therefore it is on PORTB. We won’t get into too much theory about port manipulation – there are great tutorials out there – but hopefully this will help you to understand the code a little better. 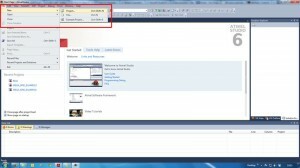 The program should compile – check for any errors in the message windows at the bottom of the screen. If you’re using the Pocket AVR from Sparkfun or the USBTinyISP, then look here for notes on how to get going. On the Tool tab, select the debugger/programmer you’re using. The LED should start blinking.